As the snow melts and Spring weather gets closer, consumers are headed outside from the warmth of their homes and offices ready to get in line at their favorite food trucks. Make sure your food truck is ready for new trends that are taking shape as the seasons change when developing your food truck’s Spring 2019 menu. Food truck consumers are looking for ways to personalize their meals. What this means for food truck owners is that you need to provide options to your existing menus that appeal to everyone from gluten-free eaters to vegetarians and vegans to paleo-diets and healthy eaters. Menu items should be swapped out as dining trends come and go because this will help your food truck menu to stay fresh and exciting for your regular customers. This is a great way for you to appeal to a larger portion of your local community. This doesn’t mean that you need to create a menu with 10 to 15 entrees, but you can still offer 4 to 6 items with various options for each. The key is that any option changes work with your food truck’s brand. Shared plates is a huge trend in the restaurant world and is one a food truck owner can adapt their menu to. Consumers are getting more and more adventurous, and usually attend food truck events in groups. If you offer smaller portions at lower prices of your popular menu items (offer a slider version of your popular full sized burgers), you will find you will have customers trying multiple entrees instead of just ordering a single item. Not only will you see larger orders but you won’t risk wasting your time experimenting with something new that may not sell. As Spring weather surfaces, so do veggies such as broccoli, Belgian endive, artichoke, morel mushrooms, Swiss chard and white asparagus. Fruits for Spring 2019 include mango, limes, honeydew, jack fruit and many others. Integrating Spring fruits and vegetables into your food truck menu will thrill many of your local consumers. Not only will these items draw the eye of consumers, but if you go one step further by using locally sourced produce you will help you attract locavores in your local market to your service window. As the weather warms and people start packing their heavy clothes away many diners start looking for more nutritious options. 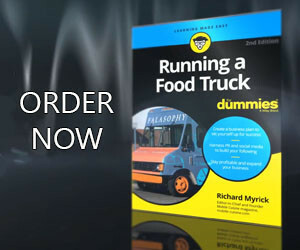 This can mean something different for every customer that walks up to your food truck’s service window, so it’s important to keep that in mind when planning your food truck’s Spring 2019 menu. By using these tips when developing changes to your Winter menu we feel that you will be able to maintain your existing customer base while at the same time you can expand it, meaning more customers and more profits.